Since I know there are always folks who are looking for recipes or meal ideas at the last minute, here are a few possible gluten-free thanksgiving menus along with links to recipes. Have a safe and joyous Thanksgiving, everyone! Looking for Gluten-Free Thanksgiving Recipes? You can find all of my Thanksgiving recipes right here. Hide & Seek: Hidden Gluten at the Holiday Table is an article I wrote about what foods to be careful about during the holidays. I mention various ways that gluten can lurk unnoticed in a variety of foods, and how to avoid it. Natalie of Gluten-Free Mommy created a recipe for Gluten-Free French Fried Onions, the perennial favorite topper for green bean casseroles, and then shows us how to make a completely gluten-free green bean casserole here. Here is my favorite gluten-free pie crust. Shauna of Gluten-Free Girl offers up A Few Ideas for a Gluten-Free Thanksgiving and How to Cook for Someone Gluten-Free (useful for relatives and friends who will be cooking for us for the holidays). 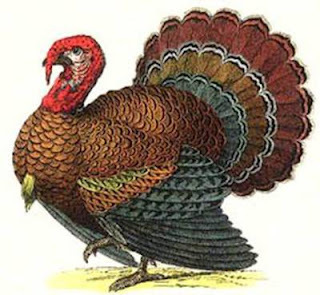 Catherine of Gluten-Free Food Guide has her own wonderful post called Gluten-Free Thanksgiving Recipes and Tips that is full of recipes and great suggestions. My dear vegan and milk-allergic readers, I have not forgotten you. This has to be one of the most popular desserts I've made, when it comes to the reactions of the people who eat the food I cook. I didn't expect that. I think I'm a pretty good cake baker, but when I tried this recipe for the first time at Rosh Hashanah dinner, I got more mmmmms and wows and ohmyg0ds with this deceptively simple fruit dessert than with the honey cakes I served it with. I made it again for Shabbat dinner on Friday and it was every bit as lovely as before. It would be a wonderful gluten-free vegan dessert option for Thanksgiving. Easy but sophisticated is what I was going for. Peeling fruit does not equal "easy" in my book, so I didn't bother. If you'd like to try peeling the pears before halving them, go for it! This recipe works best with pears that are just ripe enough to have some softness while being firm enough to be handled without their skin getting easily damaged. How long you cook the pears will depend on how ripe they were to begin with - Five minutes on each side is plenty for a ripe piece of fruit. As for sugar, any kind should work. I have used raw sugar both times I've prepared this. I sure wish these photos were better. The bits of stuff on top of the pears is ginger pieces, which I like to serve with the pear though they can be removed if you prefer. These pictures were taken before the sauce finished reducing into the dark, thick syrup that is drizzled on top of the pears - So the thin sauce you see on the pears is just the pre-reduction version of it, which I spooned on top of them before taking pictures. Imagine a thicker, darker and more syrupy sauce that can be truly drizzled across each pear. This recipe inevitably makes extra of the reduced ginger-cardamom syrup. The leftover syrup is divine, with its rich and slightly spicy flavor and sweet pieces of nearly candied ginger floating in it. It would be wonderful on pancakes or vanilla ice cream, so I like to save it in a little tupperware container for later enjoyment. Slice ginger root into very thin slices. Cut slices into narrow matchsticks. Bring water, sugar, spices, lemon zest, lemon juice and fresh ginger to a boil in a wide, heavy saucepan. Reduce heat to medium and simmer for 5 minutes. While the liquid is simmering, slice pears in half lengthwise and use a teaspoon to scoop the seeds out of each half. 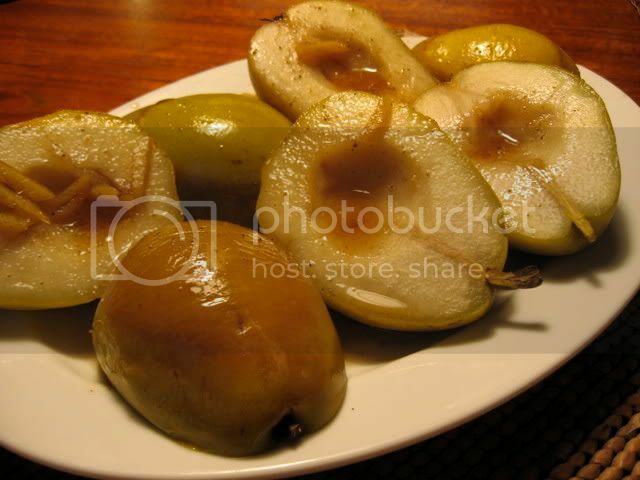 Place the pears cut-side down in the sauce pan and simmer for 5 minutes, then flip over and simmer for another 5 minutes. Baste occasionally with a spoon while cooking. Using a slotted spatula, carefully lift each piece of pear out of the liquid and place on a serving platter or individual plates. Remove the lemon zest and cinnamon sticks from the liquid (you can remove the ginger pieces, too, if you like, but I think they're wonderful left in). Bring the liquid back up to a rolling boil, and boil until it thickens into a syrup. Drizzle 1 Tbsp of the syrup across each half of pear just before serving. I haven't been inspired by Thanksgiving yet this year, which explains the lack of Thanksgiving mania on this blog. But tonight I think the bug finally bit me, if only mildly. 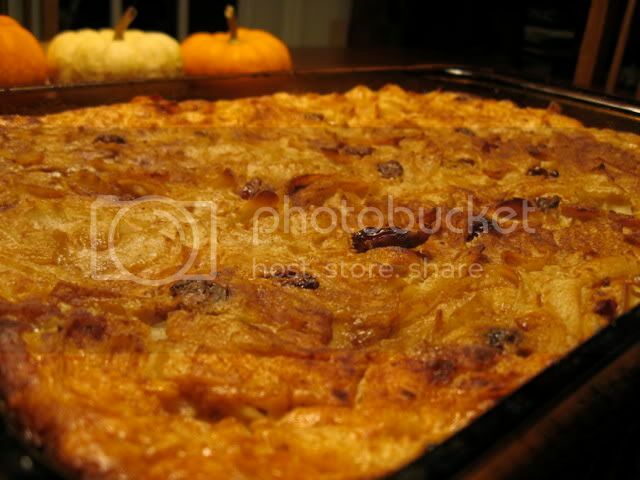 This past spring I posted my recipe for Savory Gluten-Free Noodle Kugel, a hearty mushroom-flecked kugel made with Manischewitz brand gluten-free Passover egg noodles. I made a point of stocking up last Pesach so I'd have some of these fabulous noodles to last me through the year, and I used up another bag tonight making a sweet lokshen kugel (noodle and egg casserole). I still have two or three left, just enough to get me through to this spring when they are back on the shelves at kosher grocery stores. Though I generally prefer Tinkyada noodles for just about everything, there are a few things that a wide, flat egg noodle is better for - Kugel is one of them. The fact that the Pesach noodles are made from potato starch means that they are all the more absorbent, which is perfect for a kugel. Our family has two different kugel traditions - My dad's side of the family makes savory noodle kugels. On my mom's side, it's sweet kugel all the way. Since I made savory kugel last time (and boy was it good) this time I tried to sweeten it up without overdoing it on the sugar. What I ended up with was the Thanksgiving Kugel. There are thousands of bubbes rolling over in their graves at the very mention of the words "Thanksgiving" and "kugel" next to each other. I'm usually a little bit of a purist when it comes to ethnic foods. 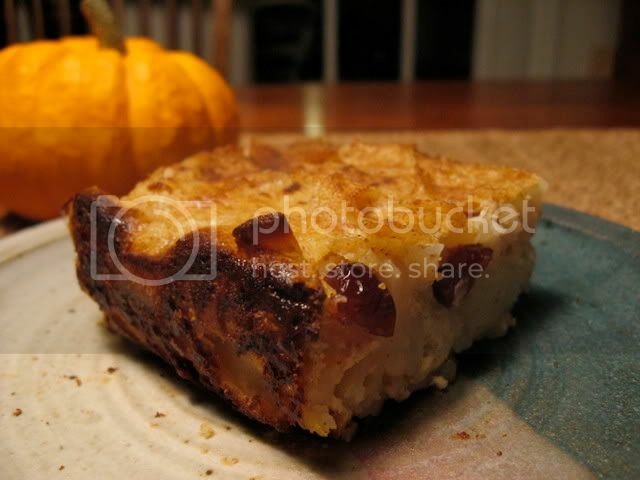 But I think if any of those bubbes would taste this kugel, they would forgive me. The dried cranberries (or "craisins" as marketing gurus seem to have renamed them) really plump up like little sweet-tart gems and make a tasty replacement for the usual raisins. I lightened the kugel up a little - Trying to make this kind of traditional food low fat is just not something I have the heart to do. But I did trim some fat from where the texture or flavor wouldn't suffer. If you like your sweet kugels really sweet, you'll want to add an additional 1/2 to 3/4 cups of sugar, since I made this to be a side dish more than a dessert. 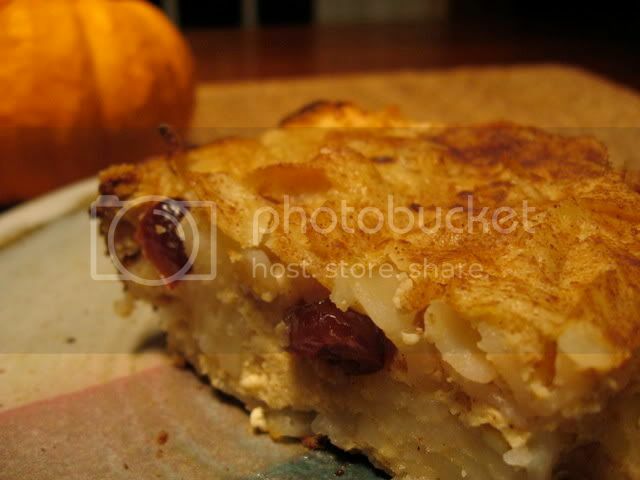 This easy kugel would be a really nice side dish for Thanksgiving, it works well by itself for breakfast, and it should heat up well in a toaster oven or conventional oven. Eat it in good health! Preheat oven to 350 F. Bring a large pot of lightly salted water to a boil. Cook noodles until tender but not overly soft, remove from heat and drain immediately, rinsing with cold water. Set aside. Grease lasagna pan. In a blender, combine spices, salt, sugar, milk, eggs, sour cream and farmers' cheese. Pulse until smooth. In a large bowl, pour liquid over the noodles. Add cranberries. Stir until well-combined. Pour entire mixture (including all "extra" liquid) into the greased pan. Dust the top with additional sugar and pumpkin pie spice. Bake for 35-45 minutes or until the top is golden-brown and the egg mixture has become slightly firm (will still be somewhat soft - do not overcook!) 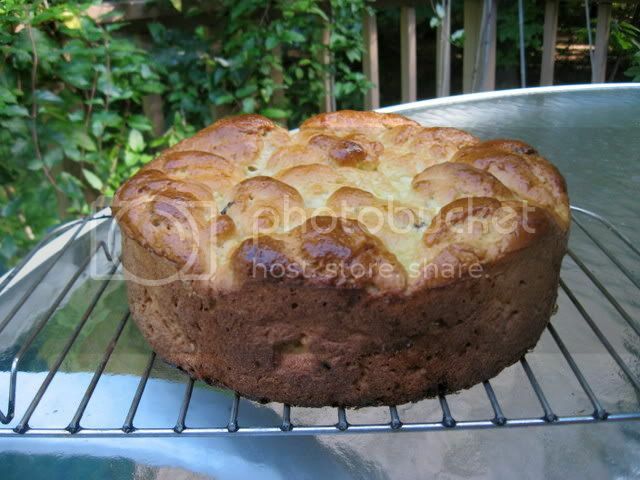 Allow to cool for 15 minutes before slicing and serving warm. * If you don't have access to gluten-free Passover egg noodles, gluten-free tagliatelle or lasagna noodles (cut in strips after cooking) will work, though the texture won't be quite the same. I'm impressed with the Tinkyada Brown Rice Grand Shells . They hold up pretty darn well and are easy to stuff, though I recommend undercooking them slightly and handling them with a little extra care. They're wholesome and they taste great. You could feed this dish to your friends without anyone guessing it's gluten-free. Casseroles are very much fall and winter foods for me, even if they're not made with squash or sweet potatoes. This one is a winner. This is really a tasty meal, and reheats fabulously well. I like to reheat it with a little extra sauce and/or cheese added to it for extra yums. It's a nice way to get some more vegetables and fiber into your (or your vegetable-hating child's) diet. Boil shells according to package directions in lightly salted water until al dente consistency. Remove, drain, gently rinse with cold water and allow to cool. Preheat oven to 375 F. In a heavy pan, heat olive oil over medium-high heat. Sautee onions until translucent, then add garlic and cook for 1-2 minutes. Add mushrooms and sautee until they let off a little bit of liquid. Add shredded kale and sautee until tender. Remove from heat. In a medium bowl, mash together ricotta, 4 ounces of mozzarella, 1-2 Tbsp of parmesan, spices and egg. When combined, add the sauteed vegetables and mix well. In the bottom of a baking dish spread one cup of marinara sauce. Stuff each pasta shell gently but generously with the filling (you know it's properly stuffed when some filling should is coming out of the shell) and lay in the baking dish. When you have stuffed all of the shells, pour remaining two cups of sauce evenly over the shells and sprinkle with mozzarella and optional parmesan. Cover with tin foil and bake for 35 minutes. Remove tin foil and bake for additional 10-15 minutes. Remove from oven and allow to sit for at least 15 minutes before serving. 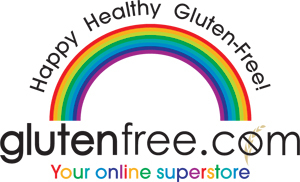 The blogosphere has been truly hopping with wonderful gluten-free recipes the past few months. 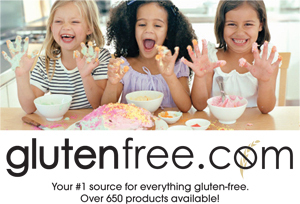 New gluten-free blogs keep popping up, and more blogs that aren't strictly gluten-free have been publishing GF recipes, which is wonderful to see. Recent trends I've noticed include gluten-free pasta making from scratch and ingredients like quinoa and agave nectar. Health-oriented and vegan recipes abound these days. But fear not, there are plenty of recipes for you sugar addicts and fans of refined grains and saturated fats, too. Thanks for all the inspiration all of you bloggers have been providing me with recently. This list is only the tip of the gluten-free iceberg. I've tried something new this time, categorizing recipes in order to make it easier to find what you're looking for and to plan a menu. The categories are a bit arbitrary - One woman's side dish is another woman's entree. So let me know if these categories work for you or if there's anything else I can do to make this list more useful. All of these recipes are gluten-free and kosher, or require no more than one substitution to become so. I hope you find this roundup useful, I sure had fun putting it together. Give a shout if you try one of the recipes. Bon appetit! Cherry Clafoutis a/k/a "Postoperative Clafoutis"
Disclaimer: As usual, there are recipes on here that call for ingredients that can be found in both gluten-free and gluten-laden versions (soy sauce, breadcrumbs, etc). There are also ingredients that are available in both kosher and non-kosher versions (and of course milchig and fleishig and pareve). I haven't checked over every ingredient list with a fine-toothed comb, so be sure to check labels, and be creative!